Hurry! A new Offer For Old Users Is back again in Paytm . 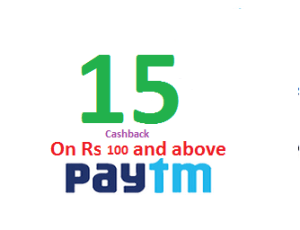 Here Do a recharge of Rs.100 or more and Apply the given coupon and Get Rs.15 Cashback within an hour. For Small Recharges its a fabulous offer. Do Try and avail the offer as its a limited Period Offer and will be Ending Soon. Upto 5 Times Per User. End Of the Month Offer! Use Coupon : EOM100 [5 Times Per User]. Valid for Today Only! Select Operator and Enter Amount 100 or More than 100. Now On the Next Page Apply Promo Code : “EOM100”. Offer valid till 30th September ,2015 11:59pm. Tags :- Recharge loots , Loot Offers ,Paytm Coupons ,Coupons code, Promo codes ,Paytm loot offer , Tricks , Paytm Cashback offers, Recharge offers, Free Cashback.